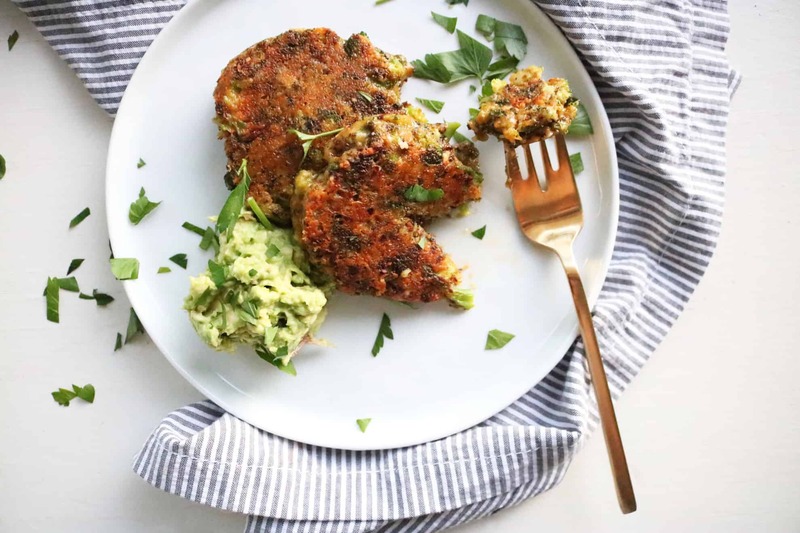 These broccoli cheddar patties are such a deliciously cheesy and easy weeknight dinner that are super kid friendly! Low carb + gluten free recipe! Then I came home and right before I put the kids down for the night, they were chasing each other down the hallway and laughing at each other. It was that super tired, infectious kind of giggle that literally melted my heart. It was one of those moments that you take a mental snapshot and try to remember five, ten, twenty years from now. They came to cuddle with me on the rocker and gave me the sweetest kisses goodnight. I felt whole again. For all the mamas that feel broken down. I see you. And you’ve got this. Lately I’ve been feeling kind of burned out. There’s been a train of sickness passing through our house. It’s like a baton we hand off with some sort of Olympic skill. Sick kids just drain every ounce of energy you never knew you had. Then they rebound with an insane amount of energy at the exact moment you, the parent, get the slippery slope of a “sore throat.” Major apologies if my posts last week were a bit lackluster. I was feeling, well, lackluster. So let’s make some Broccoli Cheddar Patties!! Place the broccoli pieces in a large pan over medium heat with coconut oil. Cook for 5 – 7 minutes (mine took 7) until they just begin to brown. In a large bowl combine the cheeses, sea salt, and garlic powder. Add the broccoli and egg to the bowl and mix to combine. Finally, sprinkle the arrowroot flour over the whole mixture and then mix it all up to be completely blended. This step is optional. I think the cheese will hold everything together without it, I just like the extra assurance of some starch in there. Set aside for 5 minutes. I find when you let things sit for a bit, it helps it bind together, especially in these patty type of recipes! Now, after the patty mixture has rested, wipe out your pan that you used to cook your broccoli. Add a couple more tablespoons of coconut oil for frying the patties. Turn it on medium high heat and allow the oil to get hot. With your hand, form a ball (a little smaller than a tennis ball) of the mixture. Place the ball in the oil, wait a minute, then use the back of the spatula to press it down gently. Cook for about 1 – 2 minutes, then gently flip. Cook the opposite side for another minute or two. Place on a plate lined with a paper towel to absorb any excess oil. Serve with a large dollop of avocado and garnish with cilantro. Want to add some protein? Add some cooked ground beef, crumbled bacon, shredded chicken, or sausage bites to the patty mixture before you pack them into balls. It really adds a whole new element to it! Chop the broccoli in small-ish pieces, a bit smaller than your normal florets. In a large bowl combine the cheeses, sea salt, paprika, ground mustard, white pepper, and garlic powder. Sprinkle the whole wheat flower over the whole mixture and then mix it all up to be completely blended. Set aside for 15 minutes. This will help the mixture bind together. While your patty mixture is resting, smash your avocado. After the patty mixture has rested, wipe out your pan that you used to cook your broccoli. Add a couple more tablespoons of coconut oil for frying the patties. Turn it on medium high heat and allow the oil to get hot. With your hand, form a ball (a little smaller than a tennis ball) of the mixture. Place the ball in the oil for about 30 seconds to a minute. Then, use the back of the spatula to press it down gently. Cook for about 1 – 2 minutes, then gently flip. Cook the opposite side for another minute or two until golden brown. Top each patty with some avocado yumminess and cilantro for garnish!